King of Prussia; born 1712; reigned from 1740 till his death in 1786. He was not friendly to the Jews, although he issued a "Schutzjude" patent to Moses Mendelssohn in October, 1763. During the early years of Frederick's reign the Jews were left in comparative peace under the law of 1730. Soon after Frederick had made a treaty of peace with Maria Theresa of Austria, he proceeded to issue a series of anti-Jewish edicts. His policy was to maintain the proportion between Jews and Christians in Prussia at a definite, fixed ratio. On April 17, 1750, a "neue revidierte General-privilegium und Schutzbrief vor die Judenschaft in Preussen und der Mark Brandenburg" was enacted, but was not promulgated till 1756. It was particularly oppressive. The Berlin community, consisting of 333 families (estimated at 1,945 souls), at this time had the number of its Schutzjuden fixed arbitrarily at 150; and only the eldest sons could succeed to their fathers' rights. All other Jews were declared to be "extraordinary," which meant that they were not allowed to transmit their privilege of residence to their children. Throughout the kingdom this law was enforced with much rigor. In Silesia and West Prussia no Jews could live in the open country ("plattes Land"). Jewish servants were not allowed to marry; and Jewish beggars and pedlers were inhibited. During Frederick's entire reign the Prussian Jews continually protested against harsh edicts, but without much success. In 1763, however, succession to the rights of the Schutzjuden was extended to second sons on condition that these take up manufacturing. For this privilege the Jews had to pay 70,000 thalers. For further privileges the Jews had to purchase a definite number of pieces of porcelain from the royal porcelain manufactory. These pieces were often specially made in grotesque shapes, as in the form of apes, and for this reason were afterward much valued by collectors. In addition to such exactions the Jews paid regular taxes. While the Jews were prohibited from following certain trades and occupations (flax-spinning, 1761; agriculture, 1763; flour and wood industries) because of the jealousy of Christian competitors, they were compelled in 1768 to take charge of the stocking and cap manufactories at Templin and to become absolutely responsible for their financial success. By the rescript of 1750, severe penalties were imposed on those Jews who practised usury. In 1752-53 interest rates were fixed at 12 per cent per annum, and in 1755 at 6 per cent and 7 per cent. Bankrupts were harshly dealt with; and the entire Jewish community of a locality was made responsible for the crimes committed by Jewish thieves (1773). In 1770 the oppressive usury laws were somewhat modified by repeal acts. 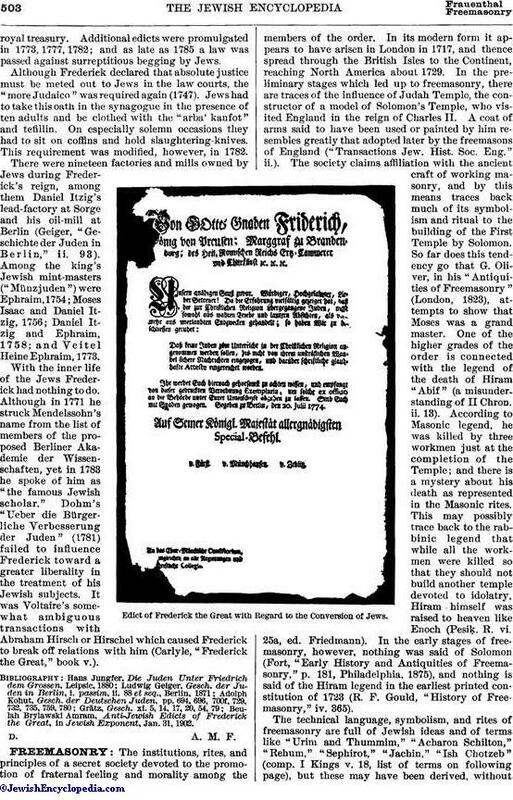 Payments of protection-money often caused trouble for the Jews in Frederick's reign. During the Seven Years' war Frederick would have no Jewish soldiers in his army; a yearly tax was paid instead. The Jews had also to bear a share of the ransom imposed on Berlin by the Russian invaders of 1763. During the war, moreover, the Jews had to lend large sums of money to the king. In 1765 the 438 Jewish families in Berlin had to pay a tax of 25,000 thalers; hitherto an annual tax of but 15,000 thalers had been paid for 250 families. In 1770 the Jews were not allowed to pass buckets at fires; a yearly tax was imposed instead. In 1773 the Jews had to deliver a certain quantity of silver to theroyal treasury. Additional edicts were promulgated in 1773, 1777, 1782; and as late as 1785 a law was passed against surreptitious begging by Jews. Although Frederick declared that absolute justice must be meted out to Jews in the law courts, the "more Judaico" was required again (1747). Jews had to take this oath in the synagogue in the presence of ten adults and be clothed with the "arba' kanfot" and tefillin. On especially solemn occasions they had to sit on coffins and hold slaughtering-knives. This requirement was modified, however, in 1782. There were nineteen factories and mills owned by Jews during Frederick's reign, among them Daniel Itzig's lead-factory at Sorge and his oil-mill at Berlin (Geiger, "Geschichte der Juden in Berlin," ii. 93). Among the king's Jewish mint-masters ("Münzjuden") were Ephraim, 1754; Moses Isaac and Daniel Itzig, 1756; Daniel Itzig and Ephraim, 1758; and Veitel Heine Ephraim, 1773. With the inner life of the Jews Frederick had nothing to do. Although in 1771 he struck Mendelssohn's name from the list of members of the proposed Berliner Akademie der Wissenschaften, yet in 1783 he spoke of him as "the famous Jewish scholar." Dohm's "Ueber die Bürgerliche Verbesserung der Juden" (1781) failed to influence Frederick toward a greater liberality in the treatment of his Jewish subjects. It was Voltaire's somewhat ambiguous transactions with Abraham Hirsch or Hirschel which caused Frederick to break off relations with him (Carlyle, "Frederick the Great," book v.). 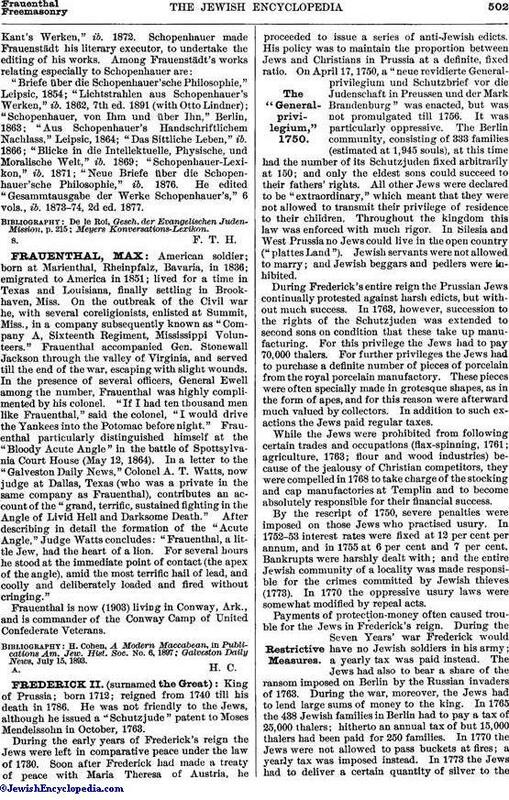 Beulah Brylawski Amram, Anti-Jewish Edicts of Frederick the Great, in Jewish Exponent, Jan. 31, 1902.